Non-small-cell lung cancer (NSCLC) is considered as one the causes for cancer-associated mortality [1,2]. As the most frequent histological subtypes, squamous cell carcinoma (SCC) and adenocarcinoma account for about 30% and 50% of NSCLC cases, respectively . Nowadays, surgery is still regarded as the best treatment option for early-stage NSCLC, however, many patients may present regional or distant recurrence after surgery [4, 5]. To date, most of the NSCLC cases showed poor prognosis due to metastasis and absence of curative systemic therapy. Therefore, it is urgent to develop new therapeutic options in clinical practice. Oxidative stress, caused by the imbalance between free radicals and reactive metabolites, is reported to involve in the pathogenesis and progression of cancer [6-8]. To our best knowledge, lung is the major organ exposed continuously to higher oxygen and oxidant-generating environmental agents. Oxidative stress imbalance would trigger pulmonary damage and even malignancy . Meanwhile, extensive studies have been performed to investigate the expression of classical antioxidants [e.g. superoxide dismutases (SODs) and peroxidase] in lung cancer [10, 11]. Eosinophil peroxidase (EPO), is a two-subunit protein with a modified hemeprosthetic group. The gene encoding EPO protein is localized on chromosome 17 . For the protein structure, EPO shares an amino acid homology of 70% compared to the neutrophil myeloperoxidase (MPO)  that shows a genetic link with the risk for developing cancer [14, 15]. Similarly, EPO is also linked to cell proliferation and differentiation . In tumor tissues, the majority of EPO is derived from EOS , however, our knowledge on the expression of EPO in tumors is still limited. Thus, we aim to determine the expression of EPO protein in human lung adenocarcinoma (AD) using tissue microarrays (TMAs). Meanwhile, we investigated the correlation between EPO level and clinicopathologic features. NSCLC tissue and paired adjacent normal lung tissues were obtained from 30 cases received surgical resection in Jinling Clinical Medical College of Nanjing University School from March 2015 to November 2015. After surgery, the samples were stored in liquid nitrogen. NSCLC was confirmed using histopathological methods. Patients received adjuvant therapy before surgery were excluded from the study. Each patient signed the informed consent. Study protocols were approved by the Ethical Committee of Jinling Clinical Medical College of Nanjing University School. TMAs for the lung AD patients (n=90) and paired adjacent normal tissues were used to evaluate EPO expression, by using commercial kit with strict adhesion to the manufacturer's instructions (HLug-Ade180Sur-01; Shanghai Outdo Biotech, Shanghai, China). Antigen retrieval was performed in the presence of a high pressure for 5 min. The sections were incubated with the Rabbit polyclonal Anti-EPO antibody (HPA026631; Sigma-Aldrich, CA, USA) at 4°C overnight. Afterwards, the sections incubated with PBS served as negative control. The staining was evaluated based on a 0-3 scale system by two pathologists blinded to the study as follows: 0, negative staining; 1, weak staining; 2, medium staining; 3, strong staining. The scoring of the staining extent, also defined as the percentage of positive staining areas, was given based on a scale of 0 (0%), 1 (1-25%), 2 (26-50%), 3 (51-75%) and 4 (76-100%), respectively. The overall protein expression score was in a range of 0-12, which was generated by the multiply of the positivity score and the intensity. A score of ≤4 was defined as low expression, while a score of >4 was defined as high expression. Cell lines, including 4 cell lines of lung AD (i.e. SPC-A1, A549, PC-9 and NCI-H1299), 1human bronchial epithelial cell line (HBE) and 1cell line of lung squamous carcinomas (NCI-H1703), were provided by the Institute of Bio-chemistry and Cell Biology of the Chinese Academy of Sciences (Shanghai, China). SPC-A1and HBE cells were cultured in DMEM medium (Invitrogen, MI, USA) supplemented with fetal bovine serum (FBS, 10%), 100 mg/ml streptomycin, and 100 U/ml penicillin (Invitrogen, CA, USA). The other cells (i.e. A549, PC-9, NCI-H1703 and NCI-H1299) were cultured in RPMI 1640 medium at 37°C in 5% CO2. Total RNA extraction from cell lines or tissues were performed using TriZol reagent (Invitrogen, CA, USA). PrimeScript RT reagent Kit (Invitrogen, CA, USA) was used for the cDNA synthesis with random primers. Real-Time PCR was carried out using SYBR on an ABI 7500 system (Applied Biosystems, MI, USA). Primers for EPO were designed as follows: 5'-caggatgccatgtgagtgga-3, and 5'-gctaagctgtgccaaattcc-3'. The β-actin served as internal standard (5'-gaaatcgtgcgtgacattaa-3', and 5'-aaggaaggctggaagagtg-3'). PCR amplification conditions were as follows: 95°C for 30 sec; 40 cycles of 95°C for 5 sec and 60°C for 35 sec. The relative quantification of EPO mRNA expression was calculated according to the conventional 2-∆∆CT method. The protein was extracted using lysis buffer containing RIPA, protease inhibitor and PMSF. The protein concentration was measured using BCA method. Protein (40 μg) were electrophoresed on a 10% SDS-PAGE, followed by transferring onto a nitrocellulose membrane. Subsequently, the mixture was incubated with EPO antibody (1:500, category No. A81365; Sigma-Aldrich, CA, USA). The density of protein band was evaluated using a densitometry using the Quantity One Software (Bio-Rad, CA, USA). The membrane probed for β-actin served as internal control. Data analysis was conducted using the SPSS 18.0 Software. Chi-square test was conducted to investigate the association between the EPO and clinicopathologic parameters. Kaplan-Meier method was used for the plotting of the cumulative overall survival (OS) curves. Univariate analysis was conducted to analyze the relationship between each of the variables and survival. Multivariate Cox proportional hazards model was utilized to screen the independent variables that could be used for the prediction of patients' survival. P<0.05 was considered to be statistically significant. EPO expression was significantly higher in cancerous tissues compared with that of the normal adjacent tissues (P<0.05, Fig 1). 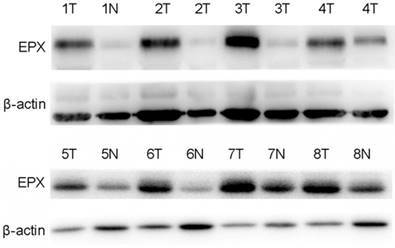 Western blot analysis demonstrated the EPO protein was up-regulated in NSCLC tissues than that of the adjacent normal tissues (Fig 2). 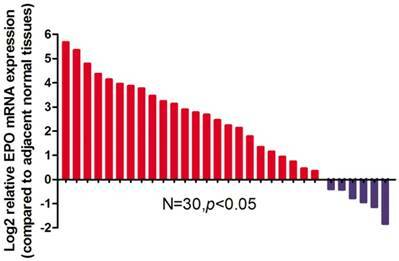 Additionally, EPO protein expression in the lung cancer cell lines was higher than that of normal lung samples (Fig 3). 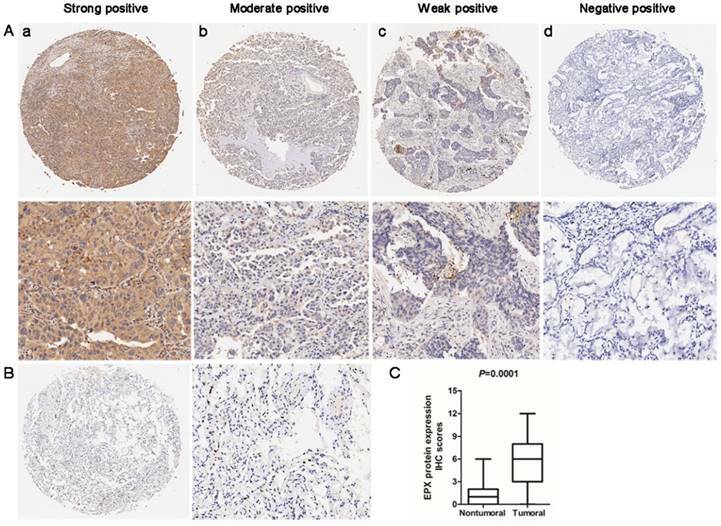 Immunohistochemistry (IHC) analysis was used to determine the expression of EPO protein in the lung AD carcinoma tissues and adjacent normal tissues. EPO protein was mainly localized in cytoplasm. The representative staining for EPO immunohistochemistry were shown in Fig 4A. In normal lung tissues, no staining or weak staining was observed (Fig 4B). EPO protein expression in lung AD tissues was significantly up-regulated than that of the normal adjacent tissues (P=0.001, Fig 4C). Taken together, we concluded that the up-regulation of EPO may involve in the pathogenesis and progression of lung AD. Table 1 showed the relationship between EPO overexpression and clinicopathological characteristics in lung AD patients. 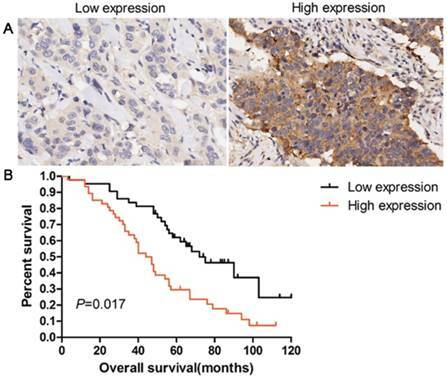 EPO protein overexpression (>4) was significantly correlated with pathologic-tumour nodes metastasen stage (p-TNM stage, P=0.017), as well as lymph node metastasis (P=0.027). No significant correlation was noticed between EPO expression and the other clinicopathological characteristics. Patients with overexpression of EPO protein showed a shorter survival time than those with low levels (P=0.017, Fig 5). Univariate analysis was used to evaluate the correlation between prognosis and other clinicopathological factors in patients with lung AD, which revealed that male gender (P=0.046), advanced pT status (P=0.023), advanced pN status (P=0.012), poor differentiation (P=0.038), and EPO status (P=0.014) were significantly associated with poor prognosis. Additionally, multivariate analysis showed that EPO status was an independent marker for predicting poorer overall survival (OS) in lung AD patients (HR=3.145, 95 % CI=2.016-5.519, P=0.018, Table 2). These results indicated that EPO was an independent factor for predicting the survival in lung AD patients. Expression levels of EPO protein in 90 paired lung AD tissues and paired adjacent non-tumoral tissues by immunohistochemistry (IHC). (A) Representative examples of EPO protein expression in lung adenocarcinoma (ADC). (a) Strong-positive expression of EPO; (b) Moderately-positive expression; (c) Weak-positive expression; (d) Negative expression (B) No staining or weak positive in normal lung tissue. (C) Statistical analysis of EPO scores in lower panel. We firstly reported the expression of EPO in lung AD tissues. Our data demonstrated that expression of EPO mRNA and protein showed significant elevation in lung AD tissues than that of the paired normal tissues. Additionally, EPO over-expression could serve as an independent factor to predict the prognosis of lung cancers. The release of EPO is mainly associated with the activation induced by many stimuli including immunoglobulins-mediated mechanisms, surface-bound complement, as well as lipid mediators . EPO is exclusively generated in mature circulating EOS, and partial of the protein were detected in neutrophils of the peripheral blood . According to the previous studies, elevation of EPO may be the most valuable biomarker for eosinophil activation [20-22]. Thus, EPO was usually used as a marker for the diagnosis of asthma and other chronic inflammatory diseases. Previously, EPO was reported to involve in the pathogenesis of cancer, asthma, and allergic inflammatory disorders. In patients with renal cell adenocarcinoma, serum EPO was significantly higher before and during treatment compared to that of the controls . Slatter et al. showed that EPO gene polymorphism were associated with the pathogenesis of colon and rectal cancer, indicating that oxidative stress increased the risk of colon and rectal cancer . Moreover, EPO was considered to participate in the pathogenesis and development of breast cancer and lymphoma [25-27]. These studies demonstrated the roles of eosinophil degranulation-derived EPO in the pathogenesis and development of carcinoma and EPO activation may exert an oncogenic role in the progression of cancer. In our study, EPO staining was noticed in the cytoplasm of partial lung cancer cells. Then we tried to confirm that the EPO was expressed by lung cancer cells. In vitro experiments, Real-time PCR and Western blotting analysis confirmed that EPO was expressed in lung cancer cells. Therefore, we firstly demonstrated that EPO was also expressed in lung cancer cells. Besides, we also analyzed the clinical significance of EPO expression in lung AD patients, which showed a positive rate of 57.78% for EPO expression in 90 lung AD tissues. Clinicopathologic analysis indicated that EPO expression was significantly correlated with tumor size, pT classification, pN classification, and AJCC stage. Patients with high expression of EPO showed poorer OS compared to these with low EPO expression as revealed by Kaplan-Meier analysis. Therefore, EPO expression could be used as an independent prognostic indicator of survival according to the Cox regression analysis. Thus, identification of EPO may be utilized as a highly promising marker for the diagnosis and prognosis of NSCLC. To date, the mechanisms of how EPO expression involves in the progression and metastasis of cancer are still unclear. Oxidative processes have been well acknowledged to be associated with the carcinogenesis [28, 29]. Many progresses involve utility of stable markers of free radical reactions for the identification of specific mechanisms of DNA damage in vivo. Shen et al. showed that reactive brominating species formed by EPO/H2O2/Br-system of eosinophils may trigger the oxidative modification of nucleotide pools and DNA .In a recent study, EPO was reported to involve in the oxidization of bisulfite, which finally resulted in the formation of sulfate anion radicals. These intermediates triggered the oxidize target proteins to radicals, and then initiate the protein oxidation. All these demonstrated that EPO-dependent oxidative damage was closely associated with the tissue injury in bisulfite-exacerbated eosinophilic inflammatory disorders . In addition, Walsh et al. reported that EPO could cause a sustained elevation of epidermal growth factor-2 (HER2) and the phosphorylation (at tyrosine 1248), which in turn triggered the FAK-and ERK-dependent loss of the cyclin-dependent kinase inhibitor p27kip in the nucleus. Also, it promoted the proliferation and cell-cycle progression .In a previous study, EPO was also considered as a driving force for angiogenesis. Also, it promoted cellular proliferation, invasion, migration, and stimulate angiogenesis in vitro and in vivo, respectively . Moreover, EPO showed immunomodulatory effects and could inhibit the activation and proliferation of T lymphocytes  that played a vital role in the immune response. On this basis, we speculated that EPO expression in cancer cells may implicate in inhibiting anti-tumor immune response and resisting the cancer immunotherapy. In conclusion, EPO expression was up-regulated in primary or several lung cancer cell lines. A high EPO level was strongly correlated with poor survival in patients with lung AD. EPO may serve as a new biomarker for predicting the prognosis of lung AD, and regulation of EPO expression may provide a new target for treating lung AD. In future, more studies are required to identify the mechanisms of how EPO expression involves in the progression and metastasis of cancer. This study was supported by the National Natural Science Foundation of China (No. 81270079 and No.81570025). All procedures performed in studies involving human participants were in accordance with the ethical standards of the Institutional Review Board of Jinling Clinical Medical College of Nanjing University School and with the 1964 Helsinki declaration and its later amendments or comparable ethical standards. Corresponding authors: Yong Song, Department of Respiratory Medicine, Jinling Hospital, Nanjing Medical University, No. 305 East Zhongshan Road, Nanjing 210002, P. R. China. Tel: +86-025-80863591; Fax: +86-025-80863591; E-mail:yong_song6310com. Fang Zhang, Department of Respiratory Medicine, Jinling Hospital, Nanjing Medical University, No.305 East Zhongshan Road, Nanjing 210002, P. R. China; Tel: +86-025-80863591; Fax:+86-025-80863591; Email: zhangfanglabcom.